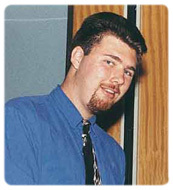 Peter McMahon of Ryerson Polytechnic University was the 1998 (and first) recipient of the NIKE Bursary created in conjunction with Sports Media Canada to identify outstanding post-secondary students of sports journalism in Canada and to be presented annually as part of the Sports Media Canada Achievement Awards. Peter McMahon was in the third year of a four year undergraduate degree course in Journalism at Ryerson. He reported for a variety of sections in the weekly publication The Ryersonian, including news and features as well as sports. His basketball coverage, in the spring of 1998, earned him the Interuniversity Media Award. Between semesters, Peter created a very successful Astronomy program which was the subject of two features in the Toronto Star and also produced an extensive travelogue piece about the program for Astronomy Magazine, the world’s largest publication for amateur stargazers.